Frank DeLuca and DeLuca Toyota support education in many ways. In today’s economy, education is more critical than ever. Business leaders have an important role to play in the community, by supporting education and lending a hand where possible. Active in Trinity Catholic High School and heavily endowed the Media Center. In doing so Frank DeLuca has perpetuated the faith legacy of his dear wife for all generations of teens. 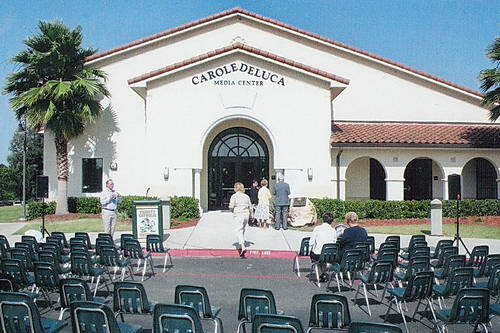 The Media Center at Trinity Catholic is named after Carole DeLuca. OCALA – Local businessman Frank DeLuca gets emotional when he talks about his late wife, Carole, who died in 2006. “She wasn’t just my wife, she was my best friend,” he said through tears. Now the philanthropist is spending his life, and his fortune, preserving her legacy by supporting the causes that were near to her heart. Tuesday morning, the Carole DeLuca Media Center was dedicated at Trinity Catholic High School, a school that the DeLuca family has backed since its inception in 2001. DeLuca provided the funding for the school’s media center, which has two computer laboratories and serves as a satellite campus for St. Leo University. The media center houses a library of written media used for daily research, and DeLuca said a fully equipped television production studio is in development. In addition to the media center, Frank DeLuca has financially supported many other endeavors and organizations in honor of his wife, including the American Heart Association’s Go Red For Women campaign, the Marion Theatre, and the Historic Ocala Preservation Society. He also rented a billboard on State Road 200 for a couple of months that displayed her picture and an in-memoriam message. “She was just a giver,” he said. DeLuca said he and Carole were high school sweethearts in Orlando before moving to Ocala in 1978. They were married for 39 years and had two children and five grandchildren. Carole, who had a heart condition, died unexpectedly during a family ski trip in Vail, Colo., after her son was involved in a serious accident on the slopes. He has since recovered. “It’s a huge void. It’s been very difficult because we were so close,” DeLuca said. Since her passing, DeLuca also has established the Carole DeLuca Memorial Scholarship Fund at Central Florida Community College. The fund especially supports students interested in the arts and horticulture. Reproduced by permission of the Ocala Star Banner. Article link. The Blessed Trinity Church does many wonderful things in our community. 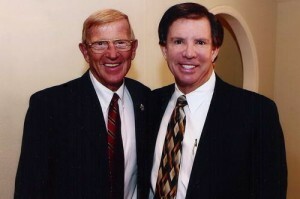 In May of 2009 I was fortunate to join a small gathering and meet the legendary Notre Dame coach Lou Holtz. His words were inspiring as always. The meeting was to support the Diocese of Orlando’s “Alive in Christ” campaign. The campaign has many goals, and among them is raising money for Catholic education. In Ocala, the targets are helping Trinity Catholic High School retire its debt, supporting a Spanish mission in west Marion, and financing a new elementary school west of Ocala.